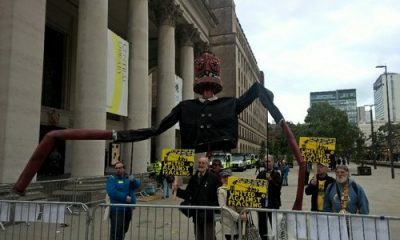 As well as making lots of noise, we also handed out leaflets to conference delegates and passers-by, asking them to call on the Secretary of State for Business, Energy & Industrial Strategy, Greg Clark, to refuse permission for fracking to go ahead. England is now the only part of the United Kingdom where fracking can still take place, after the Scottish Parliament decided to make its moratorium on unconventional extraction of coal and gas permanent. Now it’s up to us to persuade Greg Clark to ban fracking across the UK – please send him a message today.